A quick and easy, fun treat that can be made at the spur of the moment. Perfect for school parties, bakes sales, picnics and potlucks. Preheat oven to 350°F (175°C). Grease or paper-line 30 mini-muffin cups. Shape cookie dough into 1-inch balls. Place balls into prepared muffin cups; press down center to make a deep well. Bake for 10 minutes or until edges are set. Cool in pans on wire racks for 5 minutes; remove to wire racks to cool completely. Microwave morsels in heavy-duty plastic bag on HIGH (100%) power for 30 seconds; knead until smooth. Microwave at additional 10 to 20-second intervals, kneading until smooth. Cut tiny corner from bag; squeeze chocolate into each cup. Makes 30 peanut butter cups. 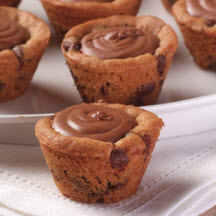 For Peanut Butter and Jelly Cookie Cups: Substitute 3/4 cup of grape or strawberry jelly for melted chocolate. Fill each cup with a teaspoon of jelly.